This is a novel that deals with the occult, but it’s more than just an occult novel. There’s lots of Frenchistentialism and romance going on in here, but I’ll be straight with you; if you’re looking for a discussion on this novel’s place in the fin-de-siècle movement, you’d best look elsewhere. The protagonist of the book divides his time researching Gilles de Rais, writing letters to a mystery woman and talking to his friends about bells. The bits about Gilles De Rais were very interesting. He was a horrible man. I’m planning to read and review the book that Bataille wrote on him soon. The other parts of this novel, although not as pertinent to this blog, were also quite entertaining. I enjoyed seeing the awkward love affair develop. 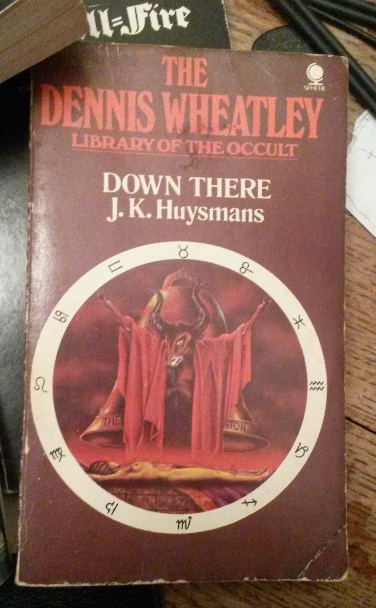 The infamous depiction of a black mass was also fun, if slightly underwhelming.My copy of the novel is a ‘Dennis Wheatley Library of the Occult’ edition, and anyone who has read any of Wheatley’s black magic novels will be more than prepared for this only-slightly sordid scene of infernal blasphemy. all the book’s characters, the Canon Docre, was based on a real person! I’ve come across the story of the Black Magic war between Abbé Joseph-Antoine Boullan and Stanislas de Guaita in Colin Wilson’s The Occult and Richard Cavendish’s The Black Arts, but I’m still hungry for more information. If anyone has any suggestions on other texts that contain information on this rivalry, I would love to hear from you! Overall, I’ll give this one a generous 8/10. It wasn’t as intense as I had expected but I did like the atmosphere and characters. I will probably read more of Huysmans’ books in the future.